Enough whining about the high price of the Modern Warfare 2 Stimulus Pack! It's time to whine about the likely high price of the Modern Warfare 2 Resurgence Pack, due out early next month for the Xbox 360. 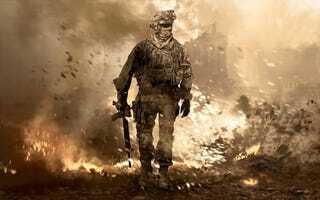 During a company financial earnings call last week, Activision's Thomas Tippl seemed to indicate that the next map pack release for Call of Duty: Modern Warfare 2 would drop in the latter half of the calendar year. Apparently Thomas Tippl cannot read a calendar, because June 3, the day the Resurgence Pack is scheduled to hit Xbox Live, is definitely on this side of the year. Perhaps he was talking about the PlayStation 3 and PC versions? Either way, it's great news for both people who enjoy playing Modern Warfare 2 and people who enjoy complaining about it. For the players, Infinity Ward is celebrating the announcement with two double experience point weekends, one starting on May 28 and the other on June 4, after the Resurgence Pack is released. As for the complainers, Activision was very pleased with the sales of the $15 Stimulus Pack, so there's a good chance the Resurgence Pack will follow a similar pricing model. As for details, all we know so far is that the pack will contain five maps. Here's hoping none of them are remakes, though judging by the name, I'd say one or two might be likely. Fingers crossed!